I'd spent the night camped in Shoshone, a small desert town just south of Death Valley. Light rain for most of the past 24hrs, on and off for the past week as well, had left the desert areas fairly saturated. It was the first time I'd seen water flowing in the Amargosa River, and possibly a first (for me) to see any desert river flowing. I was supposed to have driven home the previous day but was reluctant to leave the desert landscape during this unusual time that I found so fascinating. I figured I'd get a short hike in when I arose before starting on the long, 8hr drive home. Shoshone Point and its near-neighbor to the south are the two highest points in a small collection of hills just northwest of town. Both are found in Purcell's Rambles & Scrambles, though not glowingly reviewed - "forgettable" is used in the short description of one of them. I found the two of them made a nice pair, connected in a loop with a decent ridge hike between them that I rather enjoyed. I visited the higher of the two, Shoshone Point, first, with a nice view overlooking the small town to the southeast. A register was found from 2015 with seven pages of entries, though it is not as popular as it first seemed. The register was placed by Shoshone resident Patrick Donnelly who made all but a few of the entries over the past two years. 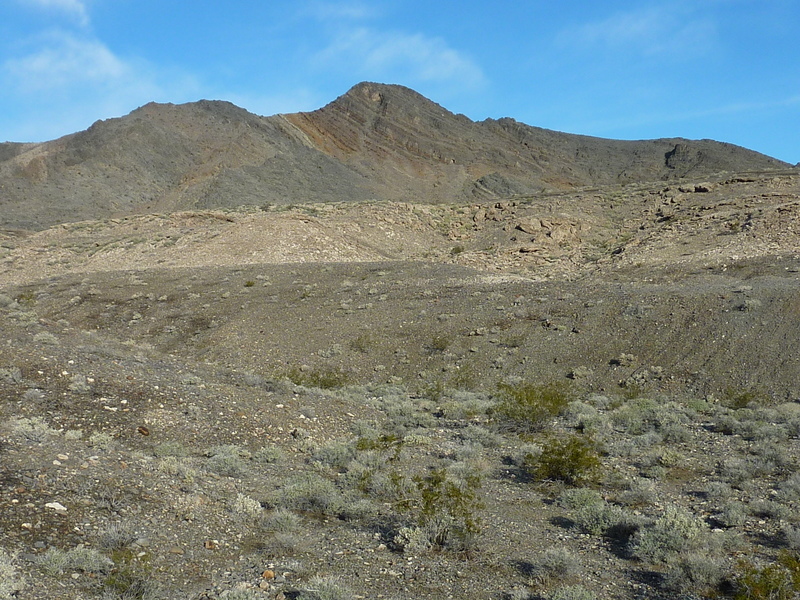 I followed the up and down ridge to the southwest for a little under a mile, taking in the desert views in cool, early morning weather, enjoying the scrambling on the primarily limestone formation. The south summit held no register that I could find. I dropped down its steep East Face, entering a wash system at the base. As I wandered east down the wash towards town, I was surprised to come across a rock-lined trail. I came to find there is a small network of trails throughout the area, undoubtedly constructed by one or more of the locals in their spare time. I followed branches that led back around the base of Shoshone Point, passing through the " Historical District" which seemed to consist of a single, dilapidated homestead from the mining days 100yrs ago. I finished up back where I'd started after about an hour and a half at a leisurely pace. Somewhat reluctantly, I got back in the van to begin the 8hr drive back to San Jose. It had been a fun trip and I was wishing I could spend another week out here. That will have to wait for next month, I'm afraid. Is this the same Patrick Donnelly that participated in SC2007? Small world.